The descendants bred by stock breeder Tiësto and Torres, one of his most famous sons, are nothing short of exceptional. Even the third and fourth generation of descendants of this invaluable stock breeder deliver fantastic results on a weekly basis. For a closer look at Tiësto's pedigree, click here. Tiësto's most famous son, and himself a racing and breeding bird with a proven record, is Torres. 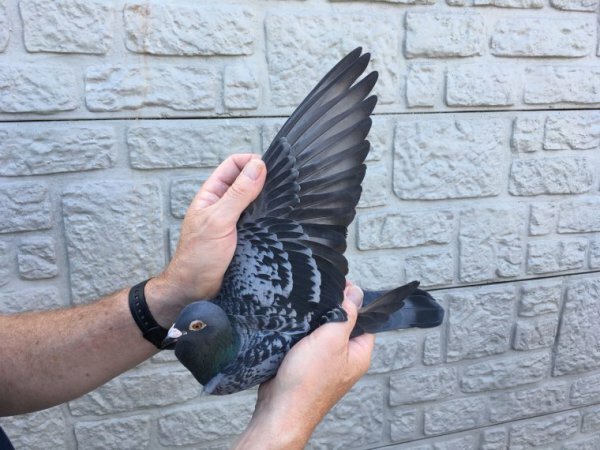 He showed his potential fairly quickly, winning a 1st National Zone Chateauroux of 4,690 pigeons. On top of that, he was Belgium's best longer middle distance racing bird four years in a row (2009-2012). And he did have everything it takes to become a successful breeder as well. 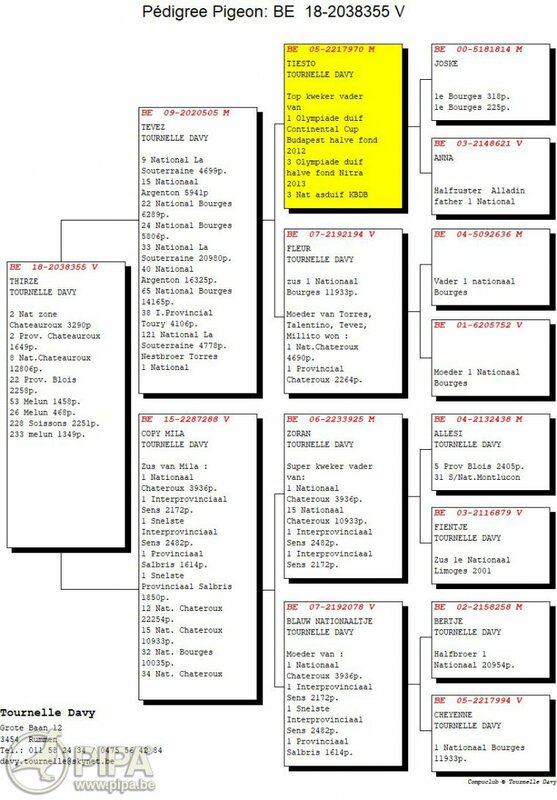 The pedigree of Torres can be found here. 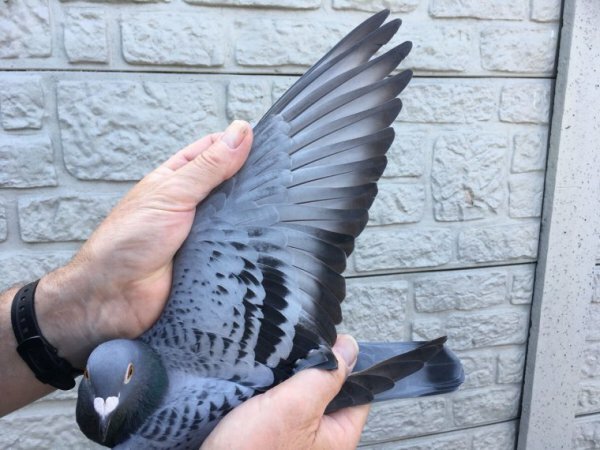 Around 90 percent of all of Davy's pigeons are to some extent related to the invaluable Tiësto bloodline: Torres, Tevez, Tiesto's Fantasy, Tiesto's White and Golden Tiesto are just a few of many highly talented descendants of this stock breeder. 2018 was without doubt one of the most demanding season of the past decade, with a lot of headwind and very high temperatures, causing quite a few races to be dominated almost entirely by some of the strongest racing birds in competition - pigeons wih exceptional endurance. And that is exactly the type of weather which the descendants of super class breeder Tiësto like to race in. Unsurprisingly, the grandchildren and great-grandchildren have had some stellar results on quite a number of occasions this season. The national race from Argenton I saw one of the most eye-catching achievements this year; the team dominated the race from start to finish. Our report of this fantastic result can be reread here. The big star that day was Tinneke (BE17-2058221). She had already won a 2nd interprov. Chevrainvilliers an a 2nd prov. Blois, and she went on to win a 1st prov. 1,253 p. and a 3rd Nat. 8,588 p. that day, which was a crowning achievement. Another top result came on 18th August, when she won an 8th National Zone of 1,748 yearlings from Chateauroux. And it resulted in yet another national top 20 prize: 17th of 4,641 pigeons. 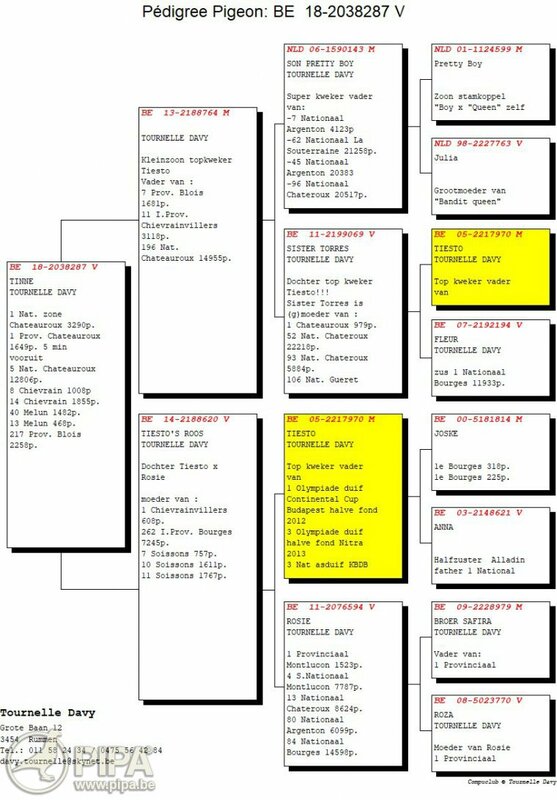 Tinneke is a grandchild of Torres, which makes her a great-grandchild of Tiësto.Click here for a full pedigree. The 2nd provincial and 5th national Argenton was won by Jewel Torres (BE17-2058073, and she would eventually become 15th National Ace Pigeon Longer Middle Distance KBDB 2018. She had already won a 7th National Zone of 3,752 yearlings from Chateauroux (7th of August) earlier on. Jewel Torres is another grandchild of Torres, or a great-grandchild of Tiësto. Her full pedigree can be found here. A grandchild of both Tiësto and Torres has won a 7th provincial and 14th National in one race, and that grandchild is BE17-2058344. She had also played a role in Tiësto's success story. Her full pedigree can be found here. 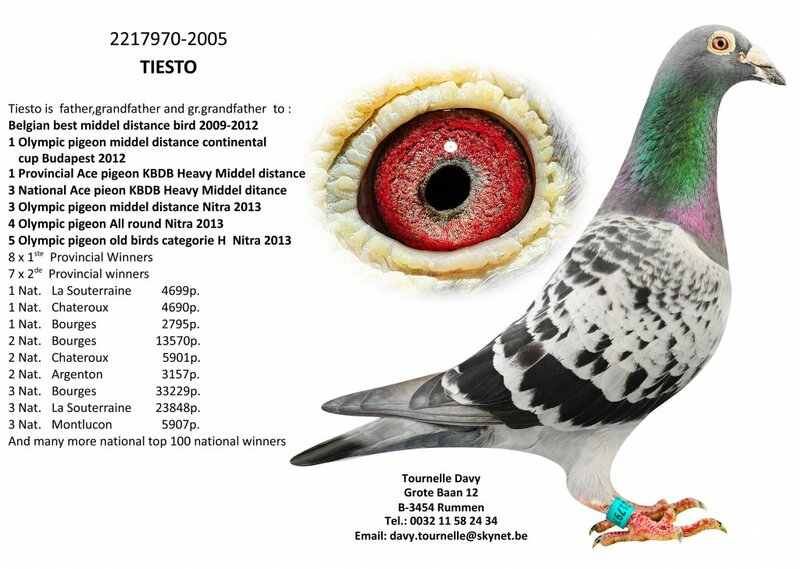 The Tiësto descendants were successful in the old birds' competition as well: BE16-2114078 won a 24th National of 5,682 old birds. She is a grandchild of Tiësto, which you can tell from her pedigree. And the young birds of 2018 follow along the same lines: the 1st and 2nd National Zone Chateauroux, the closing race of the season, was won by descendants of that same superstar. It was racing bird Tinny, BE18-2038287 who claimed a zonal first prize as a great-grandchild of Tiësto. She wins a 5th of 12,855 pigeons at national level. 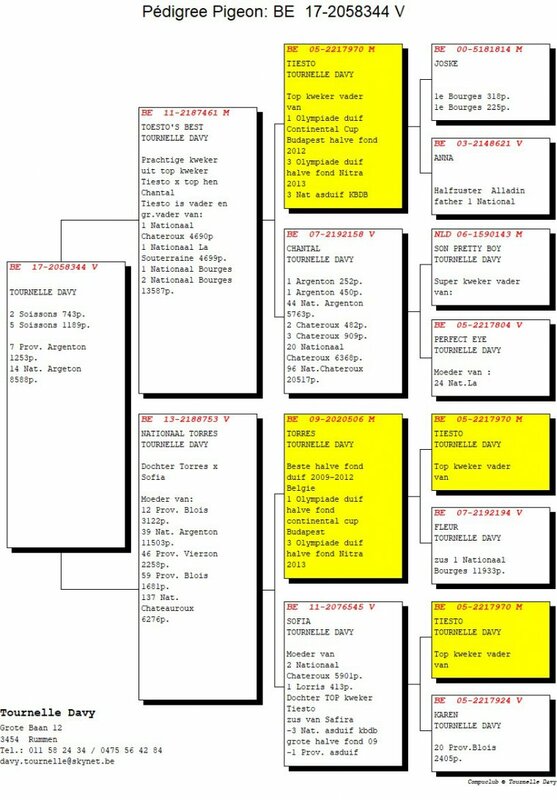 See pedigree. The 2nd prize in the zone went to Thirze (BE18-2038355), and she also won an 8th of 12,855 young birds at national level. She is a daughter of Tevez 1, which is another of Tiësto's talented sons. Her full pedigree can be found here. And then we have Red Lady, BE16-2114106. 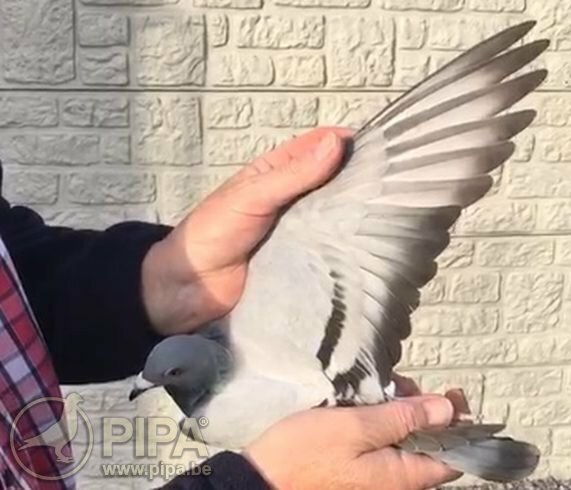 She is a granddaughter of Tiësto, and she wins a 2nd provincial Blois of 1,420 pigeons this season. Click here for her full pedigree. And how about Power Lady, BE17-2058054. 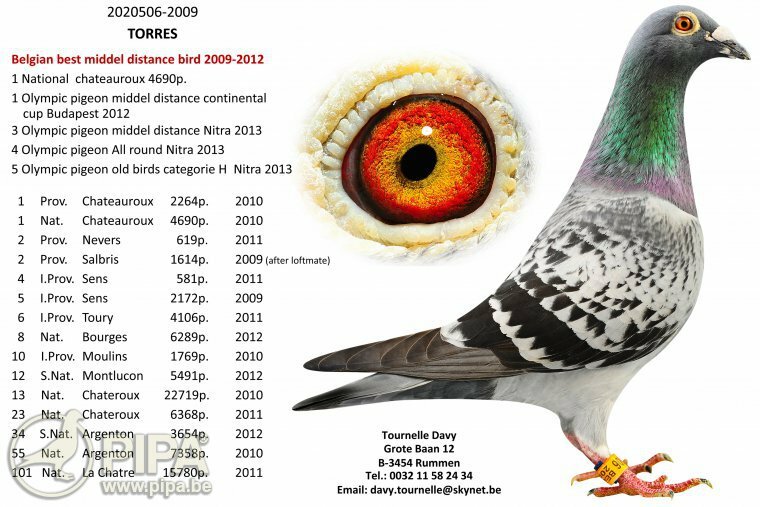 She wins a 9th National Zone Chateauroux of 6,511 yearlings, as well as a 24th National of 27,081 pigeons. Power Lady is yet another grandchild of Tiësto - see Power Lady's pedigree. 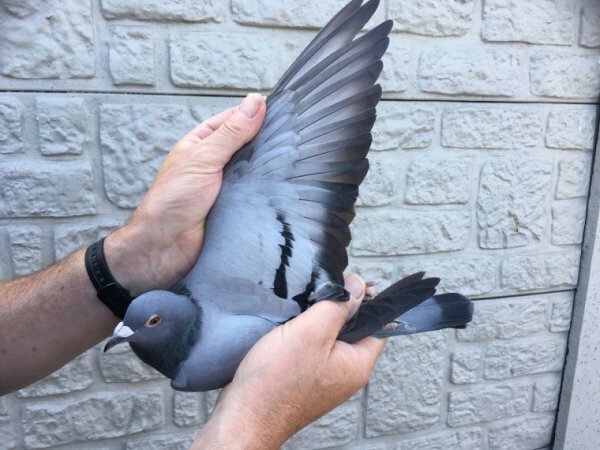 Special Lady BE17-2058063 is showing to be quite a talented hen as well, winning a 1st prize from Soissons of 743 pigeons, as well as 2 top 10 prizes from Momognies and Chevrainvilliers, and a 3rd National Zone Chateauroux of 3,752 yearlings. 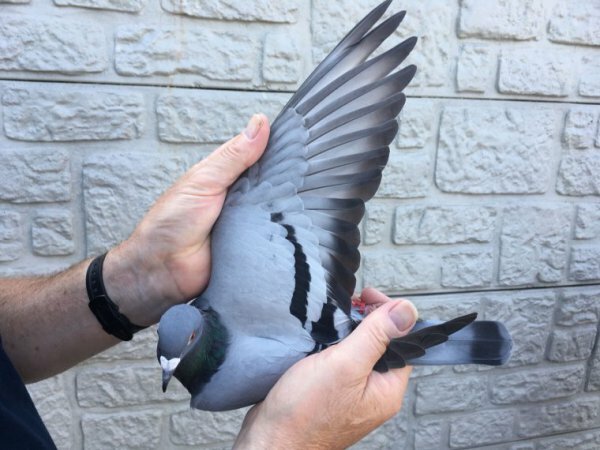 She finished in 131st place national of 13,086 pigeons. 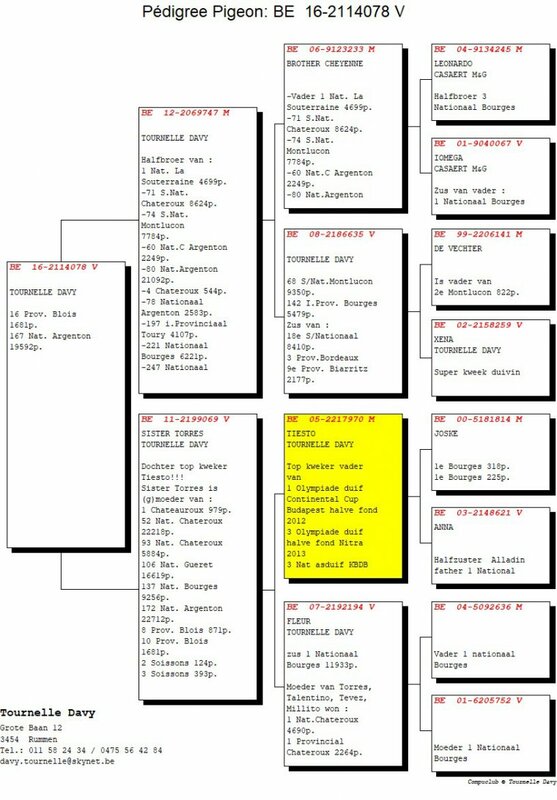 Special Lady is a double grandchild of the fantastic Torres - see pedigree. Unsurprisingly, the first line of descendants of Torres has also been performing really well. Racing hen BE18-2038149 is a direct daughter of Torres, and she wins a 39th National of 12,855 young birds from Chateauroux. Clik here for the full pedigree. Like we said, this team did really well throughout the season, mainly with the youngsters of Tiësto and Torres, and other pigeons related to these phenomenal stock breeders. It would be impossible to list all of their top results, top 10 prizes and prizes per 100 or per 10 in a single article. We think the level of quality of the bloodlines of both these breeders has been documented extensively in our previous reports as well, although we would still like to take a closer look at the fantastic overall results from Argenton. And the young birds had a fantastic season as well, judging from the results included below. If you are interested in getting a complete overview of their achievements, please refer to this page. Do keep in mind it will take a while to get through their entire palmares. 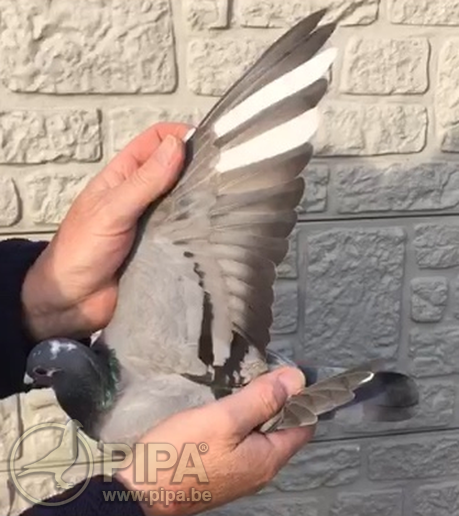 It rarely happens that two pigeons have such a significant impact on basically the entire pigeon breed of a big champion. The direct descendants of Tiësto and Torres excel almost on a weekly basis, preferrably in demanding conditions, where they would sometimes blow the competition out of the water. 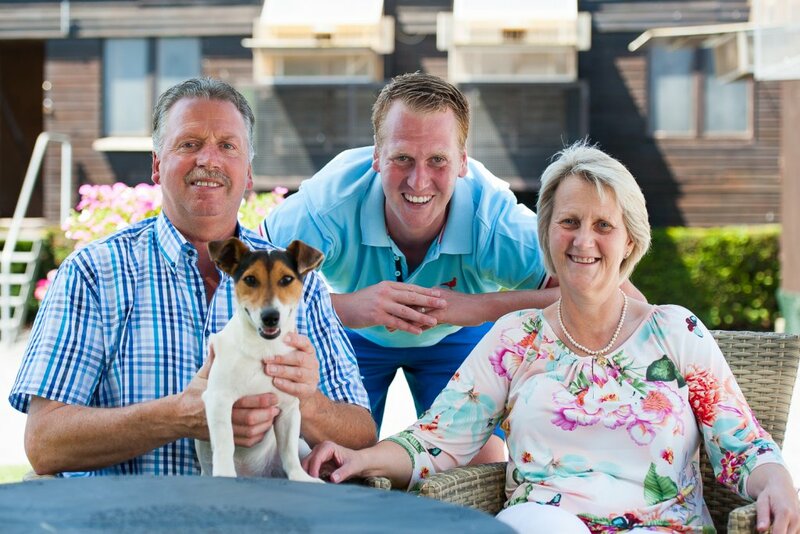 And we have seen some fantastic results even from the third and fourth generation of descendants as well, which shows that Team Tournelle has a solid future - thanks to the youngsters and grandchildren of Tiësto and Torres. And we are quite confident that their fantastic results in the racing team will eventually lead to an excellent breeding career as well. We think it will take some time before the Tiësto and Torres bloodlines have ceased to dominate the national competition.